Want to up the ante on your basic brownies recipe? These chocolate covered brownies are just one additional step – but they’re SO worth it! I’m no stranger to a semi-homemade kinda recipe. I’ve shared my love of box mixes here before in recipes like the Marshmallow in the Middle Cupcakes. Although we rarely eat junk food anymore, sometimes a girl just needs a brownie. 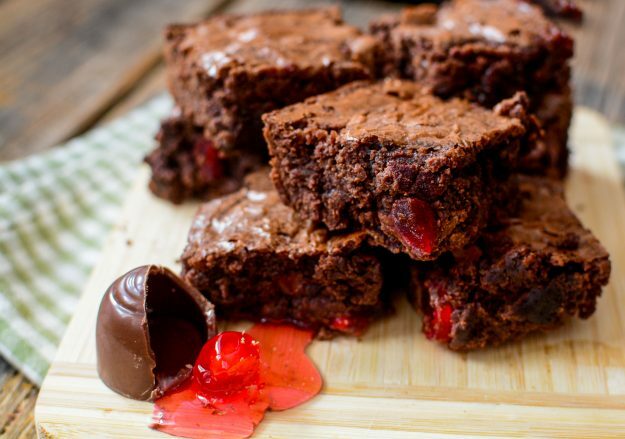 And if said brownie is full of chocolate covered cherries… then that’s even better. 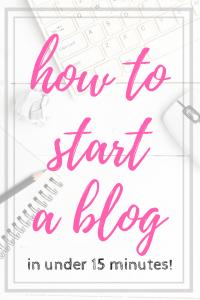 It truly is just as easy as it sounds. 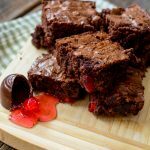 It takes about 2 extra minutes to make them (if that) then you have these gooey, decadent, over the top brownie that are a whole new level of chocolate goodness. This batch was made with a boxed brownies mix, but if you have a scratch made recipe you love, go for it! 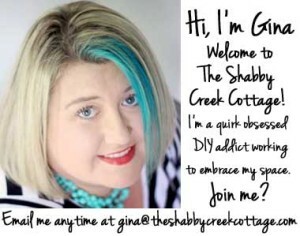 I’m pretty sure it will work just the same. Inside where the chocolate melts into the brownies, you get a more moist, chocolate chunk and a marichino cherry to boot. 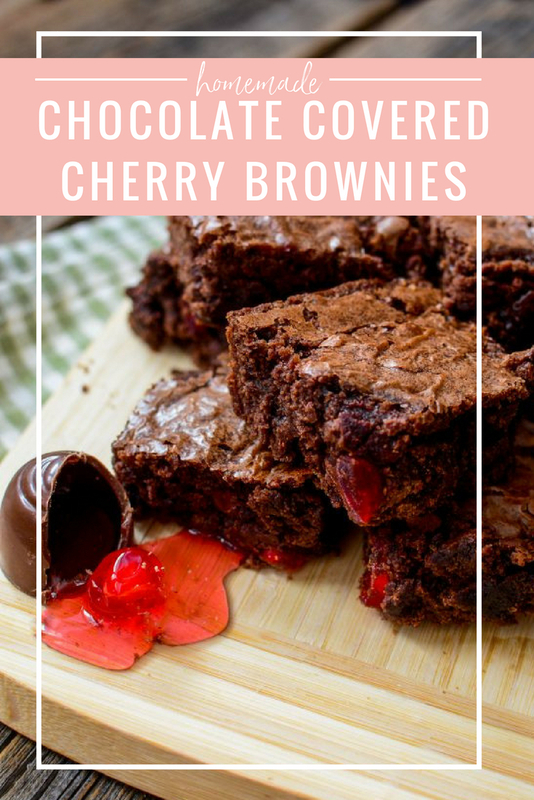 I know chocolate covered cherries are a “love or hate” kind of food – but if you love them as much as I do, then you’ll definitely want to try these brownies. But honestly, even my husband who hates the regular candy loved them, too! Line an 8x8 baking pan with parchment paper or tin foil. Place 9 of the chocolate covered cherries, evenly spaced, into the batter. It’s ok if the tops of the chocolates are sticking out, and do not push the chocolates to the bottom of the pan. Let them sit in the batter. Pour the remaining 2/3 of the batter over the cherries. Place in the oven for the amount of time the box specifies. Check with a toothpick for doneness, be sure not to test a place where there is a cherry. Remove and let cool. 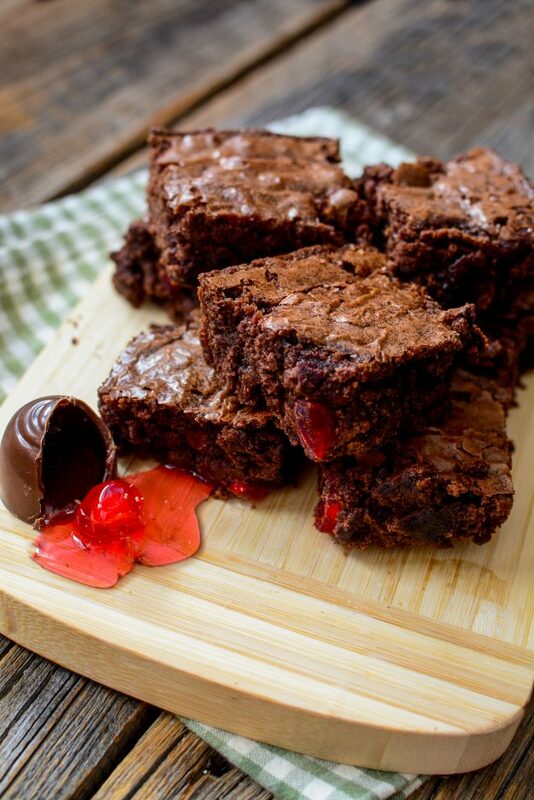 When cutting, you will be able to see where the cherry is in the brownies, so cut 9 equal squares. The filling will often sink to the bottom and sort of caramelize against the parchment paper and become chewy. This is very tasty, but the whole reason to use parchment, as if this filling hardens against the baking pan, it will be hard to separate and will mar your brownies when you lift them out of the pan.